NASA has lost hundreds of moon rock and other astromaterials loaned to researchers, museums, and educators since the Apollo lunar missions, according to a NASA Inspector General's report released yesterday. Materials originating from extraterrestrial environments, commonly referred to as astromaterials, are a rare and limited resource that serve an important role for research, education, and as a legacy for future generations. NASA’s collection of astromaterials include lunar rock and soil samples; meteorites from asteroids, Mars, and the Moon; ions from the outer layers of the Sun (Genesis); dust from comets and interstellar space (Stardust); and cosmic dust from Earth’s stratosphere. Between 1969 and 1972, the six Apollo missions returned 842 pounds of lunar material (2,196 individual rock, soil, and core samples) that subsequently have been split into about 140,000 subsamples. Since 1977, the Antarctic Search for Meteorites Program – a cooperative effort among NASA, the National Science Foundation, and the Smithsonian Institution – has recovered over 18,000 meteorites that originated from asteroids, Mars, and the Moon. NASA has been experiencing loss of astromaterials since lunar samples were first returned by Apollo missions. NASA confirmed that 516 other loaned astromaterials have been lost or stolen between 1970 and June 2010, including 18 lunar samples reported lost by a researcher in 2010 and 218 lunar and meteorite samples stolen from a researcher at Johnson in 2002, but since recovered. The Johnson Space Center’s Astromaterials Acquisition and Curation Office (Curation Office) maintains NASA’s collection of astromaterials and distributes samples for scientific study. 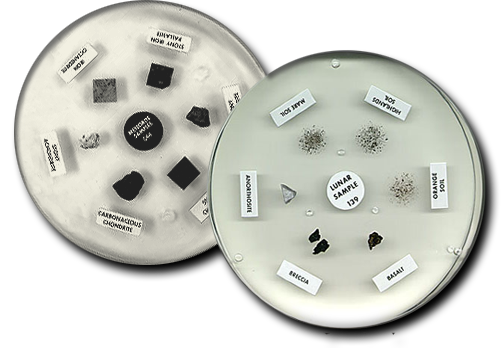 In addition, the Curation Office makes lunar and meteorite samples available to exhibitors, educators, and institutions of higher learning through NASA’s Exhibits and Education Programs. The Office manages about 140,000 lunar samples, 18,000 meteorite samples, and about 5,000 solar wind, comet, and cosmic dust samples. As of March 2011, over 26,000 of these samples were on loan for scientific study, educational pursuits, and public outreach purposes. The origins of NASA’s astromaterial collection are varied. Lunar samples were returned to Earth during the 1969–1972 Apollo missions; meteorites were obtained as a result of the Antarctic Search for Meteorites Program begun in 1977; solar wind was collected during the 2001 Genesis mission; NASA’s Stardust spacecraft – launched in 1999 – collected cometary and interstellar dust particles; and cosmic grains and orbital debris from the stratosphere have been collected by high-flying aircraft since 1981. According to the Inspector General report, NASA lacks sufficient controls over its loans of moon rocks and other astromaterials, which increases the risk that these unique resources may be lost. Specifically, the Inspector General found that Curation Office records were inaccurate, researchers could not account for all samples loaned to them, and researchers held samples for extended periods without performing research or returning the samples to NASA. The Inspector General found that these conditions occurred for several reasons. First, the Curation Office did not require loan agreements or have in place other internal procedures for safeguarding loans of meteorites and cosmic dust samples. Loan agreements specify the conditions for the loan and include security plans prescribing precautions for guarding against theft or unauthorized use of astromaterial samples. NASA requires loan agreements for lunar, Genesis, and Stardust samples but does not require such agreements for meteorites or cosmic dust samples. Moreover, the Office maintains guidebooks and internal procedures to help ensure lunar, Genesis, and Stardust samples are adequately controlled and properly accounted for but has never established similar controls over meteorites and cosmic dust samples. Second, the Office did not consistently follow its inventory procedures for astromaterial samples. For example, the Inspector General found that although NASA policy required an annual inventory from holders of loaned materials, the Curation Office did not consistently request these inventories. In fact, the Office had never requested inventories of Stardust samples and, prior to our audit, had not requested inventories of lunar samples held at locations other than Johnson since 2008. Additionally, we found that the Office’s inventory practices depend on (1) the type of sample in question and (2) whether borrowers store samples at Johnson. Third, the Curation Office’s annual inventory procedures are inadequate and do not account for all loaned samples. Specifically, to have researchers verify the samples they hold, the Office provides them with a list based on its records and requests they confirm its accuracy. We believe that an example of a more reliable inventory method would be to request that researchers provide the Office with a list of the samples in their possession and then reconcile the researchers’ lists with Agency records. In addition, the Curation Office said that due to funding constraints it has not performed a complete physical inventory of all lunar samples loaned to researchers since the 1980s. For over 40 years, NASA has loaned astromaterial samples to researchers and shared lunar and meteorite exhibits with educators and the public. However, the materials remain the property of the U.S. Government and may only be borrowed for approved research, educational pursuits, and public display. Additionally, while loan periods may range from days to years, these transfers are not intended to be permanent, and NASA retains the right to recall its samples and exhibits at any time. Because NASA does not have adequate controls in place, the Inspector General reasoned, the Agency cannot be sure of the location and security of all of its loaned astromaterials and therefore is at risk of losing these unique and limited resources.